Currently there is a ban on all types of commercial fishing in both the creek and the lagoon, the proposal would allow for the mesh netting of the system targeting all species of fish using 300m wide nets. Bournda Lagoon and Sandy Beach Creek are located in a National Park, they are vital habitats to many species of Flora and Fauna including more than a dozen threatened species, the park is an important element of the local tourism industry and is the home to a number of sacred Aboriginal sites. For these reasons and the more detailed below this proposal should be rejected in full. 1. 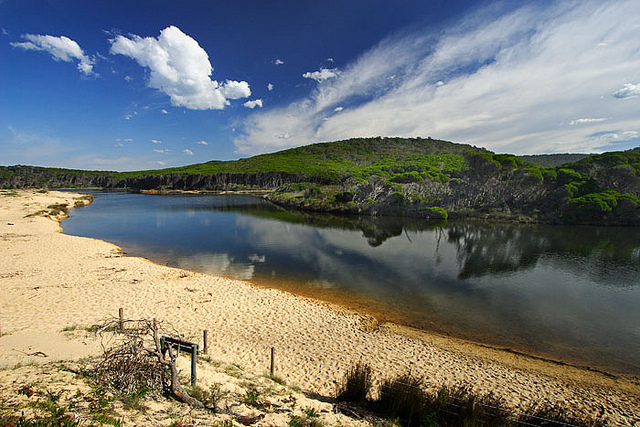 Both Bournda Lagoon and Sandy Beach Creek are located inside the Bournda National Park, a place the NSW Government itself describes as a “Natural Playground”. This is no place for a Commercial fishing operations, it is a sanctuary to a large range of Flora and Fauna, protected for all citizens of Australia to enjoy and be managed in a sustainable fashion. More than Ten threatened species call the park home including Koalas, Long-Nosed Potoroos, two threatened species of Frogs and more than 200 varieties of Birds. Currently the Lagoon is only accessible by walking track, any vehicle access that would be created for a commercial operation would be a blight on the landscape and require the destruction of the Lagoon’s surrounding environment and habitat of many of the parks fauna. 2. Bournda National Park is home to one of the largest Campgrounds on the Far South Coast of NSW, enjoyed by thousands of locals, visitors and school groups throughout the year. Tourism is a vital aspect of the economy of the Far South Coast and the Commercial fishing of Bournda Lagoon would gut the waterway of the fish many recreational fishers come to seek. It would also greatly impact on other Marine and Bird life that are viewed and enjoyed by all visitors. In the Christmas/Summer period the park is at capacity with tourists who come to relax, bushwalk, swim, fish and canoe. This influx of visitors provides a great boost to the local economy in a sustainable fashion that provides many jobs while protecting our shared natural heritage. 3. The two primary species of fish located in Bournda Lagoon, Southern Black Bream/Yellowfin Bream and the Estuary Perch are both long living native species of fish which are only sustainable when fished by recreational anglers who catch and release sexual mature fish. Both species are capable of living to over 30 years old and do not reach sexual maturity until the age of 5 or more in the Lagoon. A single season of commercial fishing could therefore wipe out the entire population. The proposal by the DPI and the Minister allows for the use of 300m wide nets, in NO part of the Lagoon or the Creek is there an area more than 300m wide, meaning that such a net would indiscriminately capture and kill all marine life. Bournda Lagoon is currently closed to the Ocean and has only briefly opened one time in the past 15 years. It is therefore impossible for the Lagoon to ever naturally restock if current residential breeding sized fish are netted. 4. Aboriginal people of the Dhurga language group of the Yuin tribe lived in the Bournda area. There is a continuous and unbroken connection to the land that has previous been recognised by the NSW State Government. Bournda National Park is home to 26 sacred sites a number of which are located directly adjacent to the Lagoon. These sites are so vital to protect that the NSW Government previously warned that “The coastal and estuarine sites are particularly vulnerable to disturbance by recreational use.” Yet now contend that a Commercial operation would have no impact. Further highlighting the absurdity of this proposal. We the petitioners call on the Minister and the DPI to immediately scrap the proposal to allow for any type of Commercial fishing in Bournda Lagoon and Sandy Beach Creek, any other outcome is simply unacceptable to the community.